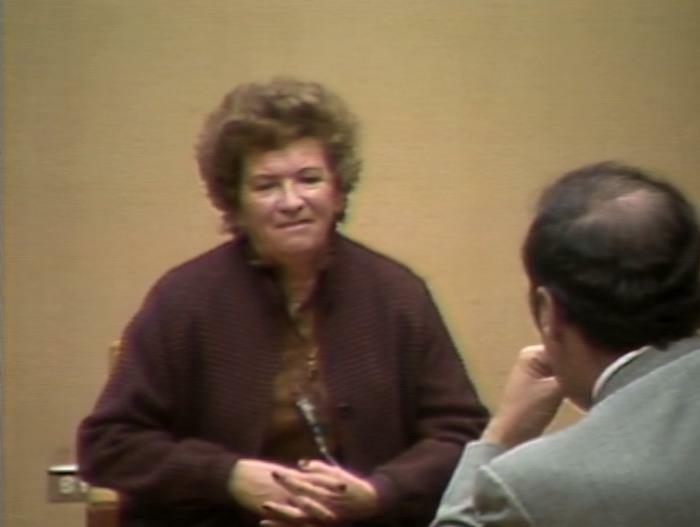 Still image from Bertha F. Holocaust testimony, April 13, 1983. SynopsisBertha F. was born in 1926 to a large family of seven children. Bertha explains how her father traveled to Belgium for business and was arrested for being a non-citizen. She explains that her family received a correspondence including a photograph of him from a camp. She describes the conditions of the ghetto and forced labour. She recalls that her mother was taken separately because she was ill. She describes deportation to Auschwitz and being separated from her siblings (she was the only one to survive). She discusses treatment from the guards. She describes her transfer to an airplane factory and forced labour. She describes friendship in the camps. She describes liberation. She describes receiving assistance from a Czech family. She describes sickness. She recalls the Hungarian civilians’ terrible attitude towards liberated Jews. She describes returning home and finding her landlord had stolen everything from the vacant Jewish homes. Bertha describes going to Germany to live in a DP camp. She describes meeting her husband (who is also a survivor) and their marriage. She discusses their decision to immigrate to Canada. She discusses her children and sharing her experiences with them. She discusses her religious identity and her faith. She discusses guilt and reflects on her survival. She discusses her identity as a survivor.